Lafayette mathematics majors recently had the opportunity to present their research at a prestigious international conference. 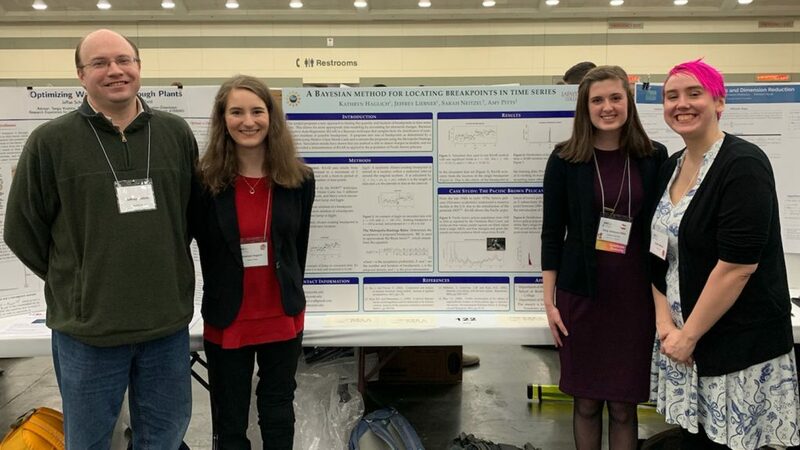 Several students and faculty mentors traveled to Baltimore in January to attend the Joint Math Meeting (JMM), the largest gathering of math scholars in the world. Keith Vreeland ’20 and Elene Karangozishvili ’21 shared research findings they gathered on campus while working with Professor Gary Gordon and Associate Professor Derek Smith, respectively, as EXCEL Scholars. Kathryn Haglich ’19 presented research she conducted as a participant in the math department’s annual summer REU program under the advisement of Associate Professor Jeffrey Liebner. Vreeland researched the “leafiness of trees,” an aspect of graph theory; Karangozishvili investigated the shortest paths in generalizations of the Cantor Set; Haglich was part of a collaborative statistics project aimed at detecting breakpoints in time-series data. Kathryn Haglich (Lafayette), Amy Pitts (Marist College), and Sarah Neitzel (Unity College) presented research from their statistics REU project, led by Professor Jeff Liebner.